A significant portion of Chad’s practice is devoted to the firm’s White Collar Criminal Defense group, where he regularly assists clients with internal investigations and advocates on behalf of businesses, executives, public officers and other individuals involved in criminal prosecutions and investigations. Chad’s best work is done when nobody sets foot in a courtroom – when he dissuades prosecutors from pursuing criminal charges. But when a case needs to be tried, Chad is ready, willing and able to defend his clients in the courtroom. 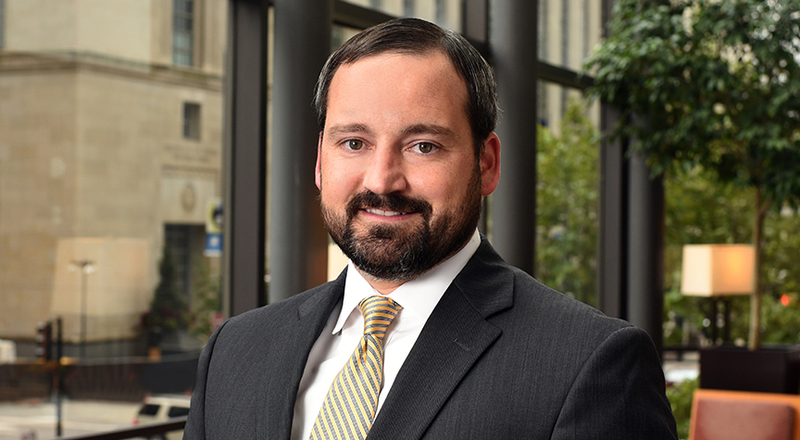 Every year since 2014, Chad has been one of less than five attorneys selected as an Ohio Super Lawyers Rising Star for white collar criminal defense. In addition to his white collar practice, Chad routinely represents companies and individuals in matters involving a wide variety of commercial litigation, including business and contract disputes, injunctive relief, creditor’s rights and collections, misappropriation of trade secrets and various other complex commercial disputes. Chad’s work in civil litigation has also been recognized, as he has been listed in Best Lawyers in America for commercial litigation since 2013. After a two-and-a-half-year investigation by the Department of Labor, the IRS, the FBI and the Ohio Division of Securities, the state of Ohio alleged that Peter A. Beck, a former Ohio State Representative, local politician and respected certified public accountant, used his political influence and conspired to steal over $2 million from individuals who invested in Christopher Technologies, a start-up tech company, and TML Consulting, a company owned by one of the co-conspirators, Thomas Lysaght. Mr. Beck was one of six co-defendants indicted on 63 charges of securities fraud, theft, perjury, wire fraud, telecommunications fraud, money laundering and engaging in a pattern of corrupt activity. All of Mr. Beck’s co-defendants either pled guilty or were dismissed, and each was required to testify against Mr. Beck as part of their plea. The Taft team, led by Chad and Ralph Kohnen, represented Mr. Beck at trial. After more than 10 weeks of testimony, Mr. Beck was acquitted on all but 13 of the charges, including the most serious charge of engaging in a pattern of corrupt activity. In August 2009, George Lang, a West Chester Township Trustee, local politician and successful businessman, testified at the trial of Orlando Carter, who was being prosecuted for his role in fraudulent conduct by a company called Dynus Corporation. Though Carter was convicted and sentenced to 15 years in prison, the government charged Mr. Lang with one count of perjury based on his trial testimony. Only 47 days after indictment, the case went to trial. Following eight days of trial, led by Chad and Ralph Kohnen, the jury returned a not guilty verdict. Mr. Lang was fully exonerated.